This volume may be the epitome of indulgence, and the tone of Marc Scott Zicree, Guillermo del Toro’s interviewer – and effective co-writer in this endeavour – can come across as a bit sycophantic at times. 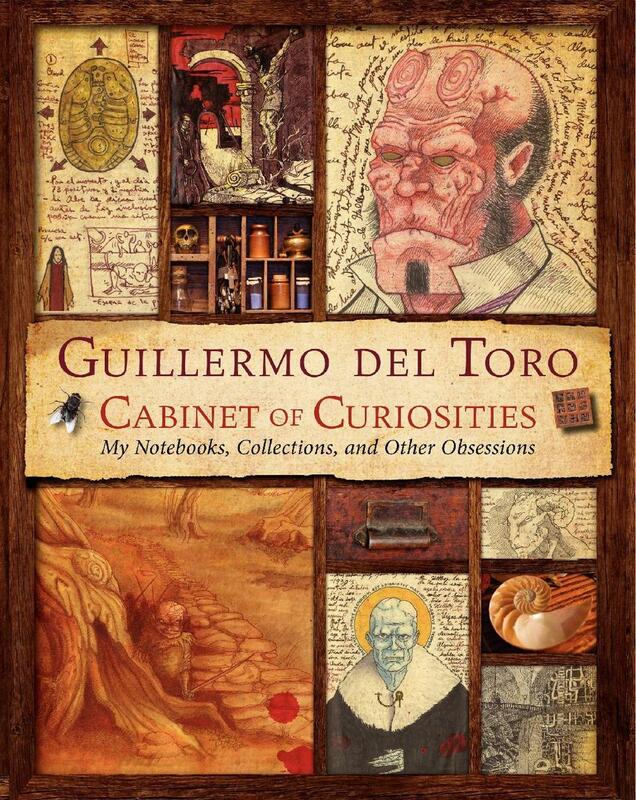 But really, a ‘cabinet of curiosities’ can’t help but be a gloriously indulgent exercise, and you don’t come here to read a sober dissection of del Toro’s life and filmography. No, you come here to luxuriate in what is probably the ultimate ‘behind the scenes’ look into Del Toro’s oeuvre, as presented in a gorgeous coffee table edition crammed with photographs and studded with mini-essays by Del Toro’s friends and collaborators (the book is framed by tributes from James Cameron and Tom Cruise, respectively). 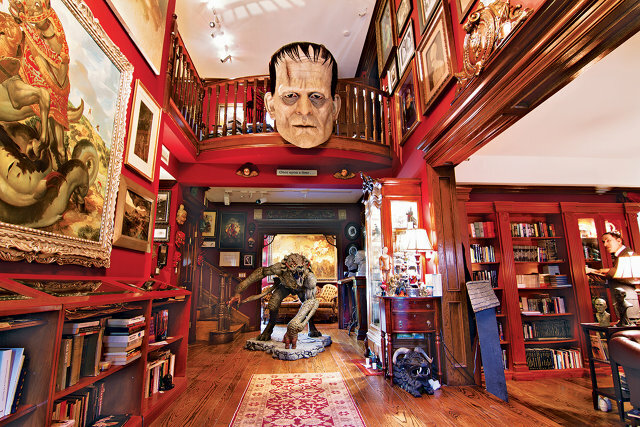 The book introduces us to Del Toro’s eclectic imaginative landscape with a bit of a tour of Bleak House – his second home and studio, which gives the book its organising principle, as the house itself is something of a cabinet of curiosities writ large – more than just a working space, it is arguably also the geeky man cave to end all geeky man caves. 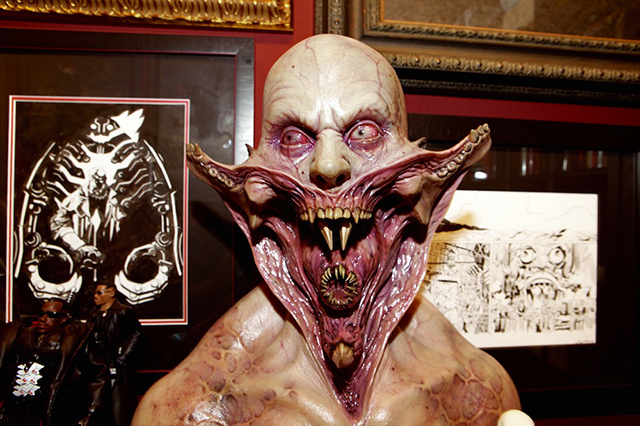 But above all, the ‘cabinet’ is really about del Toro’s colourful and frenzied notebooks, which the director has been keeping from the beginning of his career and which reveal the inner workings of his genre-melding chiaroscuro parables, from Cronos through the Hellboys and Pacific Rim. 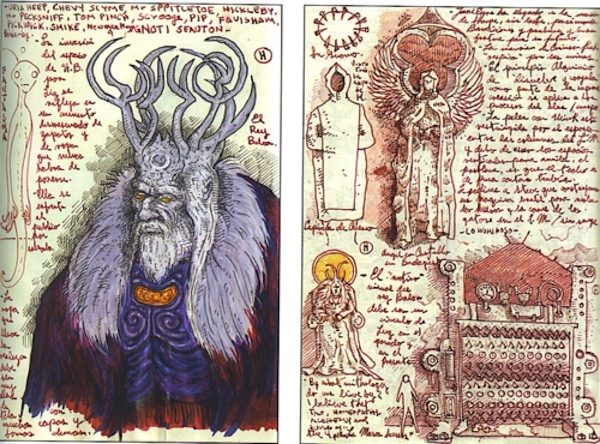 The pages of the notebooks reproduced in the book often have a drawing at the centre – usually a portrait shot of a character in one of del Toro’s films, or a close-up of some grotesque prop or monster – which would be surrounded by (multi-lingua) marginalia. These notes will probably be the most pleasant discovery for a del Toro fan as they leaf through the book, revealing, as they do, the inner workings of the writer-director’s mind, often as he’s tackling and trying to figure out several projects at the same time: practical concerns (about props, costumes and loose story threads) jostle alongside philosophical musings and personal anecdotes. As an extra, readers also get a glimpse into projects of del Toro’s that never came to fruition – an easy pitfall for a filmmaker with a tendency to multitask various media and juggle a number of projects at any given time. The most prominent – or at least, the most recent and infamous – of these is of course del Toro’s – ultimately thwarted – adaptation of HP Lovecraft’s At the Mountains of Madness. That project might just see the light of day, however, as del Toro recently announced that he’s cool with going for a PG-13 rated version of his film, under the wing of his recent collaborators Legendary Pictures (insisting on an R-rating proved to be the deal-breaker with the film’s previous studio-home-to-be, Universal). But even before this announcement – which arrived some months after The Cabinet of Curiosities hit the shelves – hope already burned for a renewal of the project. “While this project we were so passionate about didn’t work out the first time round, I know that it’s going to happen one day,” Tom Cruise, who was set to star in At the Mountains of Madness (alongside Del Toro regular Ron Pearlman) writes in the Afterword to the ‘Cabinet’. This entry was tagged At the Mountains of Madness, Blade II, Boris Karloff, Cabinet of Curiosities, Cronos, Guillermo del Toro, Hellboy, HP Lovecraft, James Cameron, Pacific Rim, Pan's Labyrinth, Tom Cruise. Bookmark the permalink.